1. You will never be short of ‘money’. 2. Your cheques will never bounce even if there is zero or negative balance in your account. 3. When you issue a cheque even if your balance is zero or negative it amounts to borrowing money from the Jharkhand Community Exchange but you do not have to pay any interest on the amount borrowed. Only your account balance will show a negative balance. 4. You can spend the Jharkhand Community Exchange ‘money’ and save your rupees for buying other things and in this way you can increase your purchasing power. 5. Because the denomination of the Jharkhand Community Exchange ‘money’ is in hours (time) it is not directly linked to rupees. Eight hours of Community Exchange ‘money’ is equivalent to the daily wage. 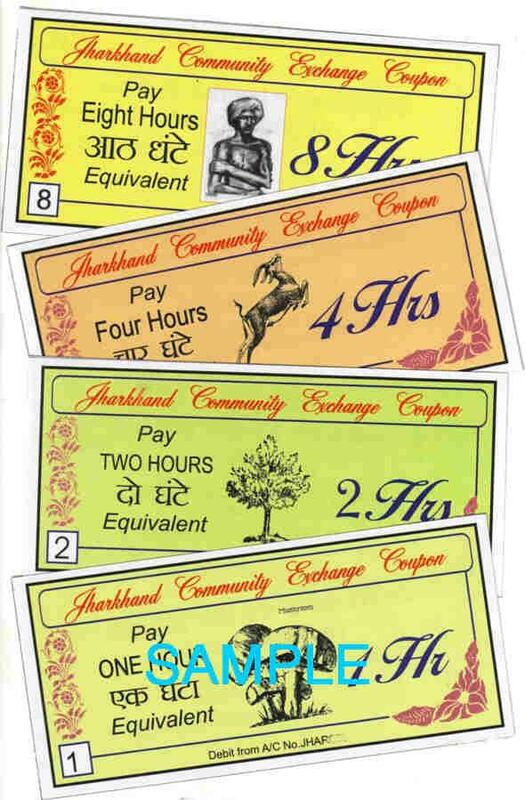 As the daily wage in rupees increases so does the value of the Jharkhand Community Exchange ‘money’. So a credit in your Exchange balance increases in value over time unlike the rupee whose value decreases due to inflation. 6. Because the denomination of the Jharkhand Community Exchange ‘money’ is in hours (time) it is not directly linked to rupees and eight hours of Community Exchange ‘money’ is equivalent to the daily wage hence it can be exchanged in 16 countries for the daily wage in those countries. Thus the vale of Community Exchange ‘money’ acquires a greater value in foreign countries because the daily wages there are higher. So the Jharkhand Community Exchange ‘money’ has a higher foreign exchange value than the rupee. 7. Apart from personal benefits you can actively contribute towards the good of society. You can prevent money from leaving your locality and filling the coffers of big businesses in far away places. 8. You can encourage the development and sustainability of local small businesses that accept the the Jharkhand Exchange Exchange ‘money’. 9. You can eliminate the supply chain associated with big businesses that bring in goods from faraway places by buying cheaper local products that do not have the additional transportation costs and further increase your purchasing power. 10. You will promote self-reliance and self-sustainability within the community by encouraging residents to produce a wider variety of goods and services to be traded with the Jharkhand Community Exchange ‘money’, rather than rely on big businesses that don’t accept this local currency. You will thus encourage the growth of the local economy. 12. Because the positive balance in your account is not conventional money in rupees it is not income and hence it is free from income tax. You can, therefore, save money in rupees by trading in the Jharkhand Community Exchange ‘money’. 13. You can check the balance in your account and download various forms such as trading slips (cheques) through any computer connected to the internet from anywhere in the world through the truly international core-banking system. 14. You can also advertise and market your products or see products advertised by others throughout the world totally free of any cost through the same international core-banking system.